Lessons from Martin Luther King, Jr. | Jon Katz, P.C. Aug 29, 2011 Lessons from Martin Luther King, Jr.
Martin Luther King, Jr., Memorial. Photo copyright Jon Katz. When Martin Luther King, Jr., delivered his I Have a Dream Speech during the March on Washington, I was nearly six months old. When MLK was assassinated on April 4, 1968, I was only five years and three days old, and he was only thirty-nine. He would have been eighty-two years old this year. Yesterday marked the 48th anniversary of the March on Washington, and was to have been the official opening ceremony for the MLK Memorial. Hurricane Irene led to a delay of the ceremony, with the new date to be announced. On yesterday’s sunny day, I visited the memorial, which is long overdue (and I look beyond its $120 million cost and the statue’s folded rather than outstretched arms, for the memorial’s larger meaning and importance), particularly in a city that witnessed customary racial segregation through the 1950’s, in a city bridged by the Virginia that mandated segregation into the 1960’s and still has courthouses memorializing the Confederacy, and in a city bordering Maryland, that had rampant segregation into the 1960’s. Martin Luther King, Jr., has inspired me tremendously not only to stand up and fight for what is right, but to do it with compassion for all (including those perpetrating heinous acts), rather than merely with non-violence. Tremendously important — as emphasized in my lead video on this blog — for instance, is King’s insistence that "injustice anywhere is a threat to justice everywhere. " One enters the King Memorial through the Mountain of Despair. 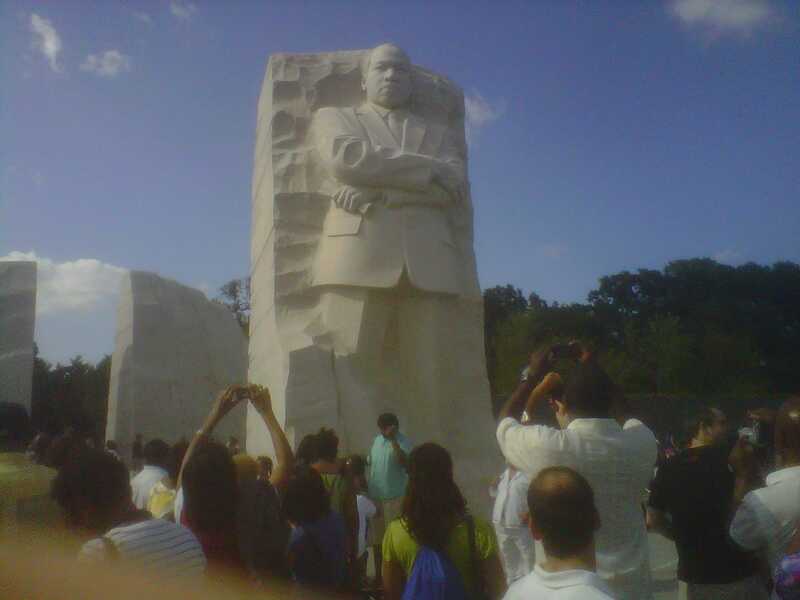 Pushed out of and forward from the Mountain of Despair is the Stone of Hope, from which MLK’s likeness is carved, looking away from the Mountain and towards the Jefferson Memorial. Behind MLK are two walls with key quotes from him that include civil rights messages, and go beyond that to cover such other social justice issues as his insistence on getting the United States out of the Vietnam War, his support for reversing poverty, his support for non-violence, and his moving beyond the concept of non-violence to that of compassion, love and brotherhood for others. A small waterfall is found near the main entrance, facing the back of MLK. This space — at least when not as heavily crowded as yesterday — is wide open and enables contemplation not only on Dr. King and his words, but also self-contemplation. The space is conducive to getting re-acquainted with Dr. King’s messages, and for the huge number of people born after his assassination to learn how alive his words, deeds and spirit remain. Diagonally across the entrance is a bookstore for more on Dr. King. I have been very positively influenced by the nonviolent path in fighting for social justice from Gandhi and Martin Luther King, How did they take up and stay on the nonviolent path? For both, their deeply-held spiritual beliefs helped them on that path. For Gandhi — writes Radhika Rao –he was also influenced by the non-violence of his mother and of Tolstoy, and the civil disobedience message of Rousseau. Martin Luther King, Jr., was heavily influenced by Gandhi’s non-violent path, starting with Mordecai Johnson’s discussion of Gandhi. Ironically, hanging in King’s office was a picture of Gandhi; both were assassinated. When accepting the Nobel Peace Prize in 1964, MLK underlined that "unarmed truth and unconditional love will have the final word in reality."